Paste is looking for editorial, design and social media interns to join us in our Decatur, Ga., office. Summer internships begin in May and conclude in August. The application deadline is Friday, March 29. As always, we’re looking for smart, talented and hungry writers/editors and designers who love music, movies and all that jazz. On the social side, we want to hear from you if you are glued to Twitter all day, and can brainstorm creative and hilarious content for all of our social platforms. Internships are unpaid, though all in-house interns will receive a $500 stipend. Typical hours are 9 a.m. through 5 p.m. Monday through Friday, though scheduling is flexible to accommodate classes and part-time jobs. In-house candidates are preferred, though remote interns will also be considered. As an intern, you won’t be making anyone coffee, unless you want some, in which case you will make your own. Instead, you’ll be working with our editorial staff, writing and editing daily, as well as handling administrative tasks, such as assessing the CDs we receive each week. Social media interns will help manage all of Paste’s social media platforms, while design interns will work directly with our editorial staff, contributing graphic design and illustration work to our various platforms. If all this is music to your ears, editorial applicants can send a resume, cover letter and (preferably published) clips to internships@pastemagazine.com. Design applicants can send a resume, cover letter and work samples to internships@pastemagazine.com, with “Design Internship” in the subject line. 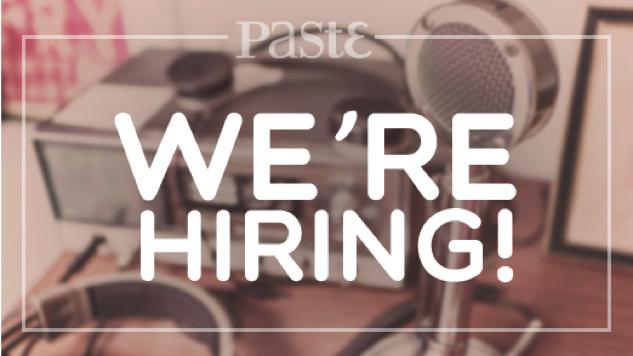 Social applicants can send a resume, cover letter and social media handles to annie@pastemagazine.com. All applicants should be sure to note education (with GPA), relevant experience, any specific sections you are interested in, and why you want to intern at Paste. Find more info on our internship page here, and feel free to reach out with any questions.